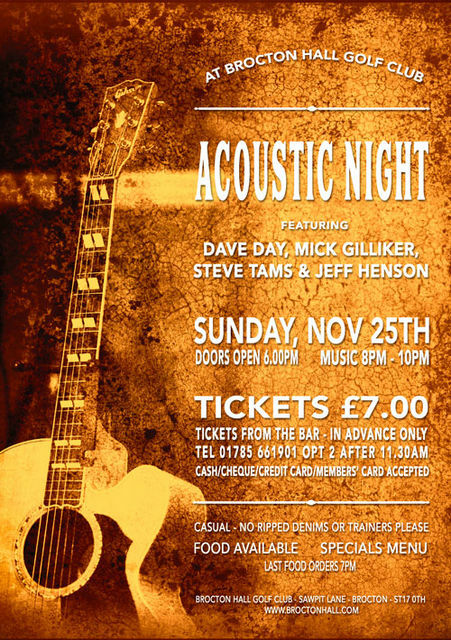 Tickets are now on sale for the Acoustic Night on Sunday 25th November! Appearing with Dave Day will be guitarist Mick Gillicker as well as Steve Tams (Keys) and Jeff Henson (Bass). Looking forward to another great evening of live music! Get your tickets early as the last one sold out! Payment can be either by cash, cheque, credit card or if you are a member you can pay on your Members' Card. Dress: Casual no ripped denims, tracksuits or trainers please. If you’d like to order food please let our Bar & Catering Team know in advance by contacting the Bar (Tel 01785661901 Opt2 - after 11.30am). Last food orders 7pm.